This month we will examine and discuss a network meta-analysis comparing efficacy of anti-tumor necrosis factor inhibitors (TNFi) in ankylosing spondylitis (AS). To date, there have only been 2 head-to-head analysis of TNFi in AS. However, this methodology uses a common comparator (such as placebo), to make an indirect comparison between 2 or more medications that have not been directly compared. Figure 1 from the article below demonstrates these comparisons among 6 different TNFi therapies in AS. 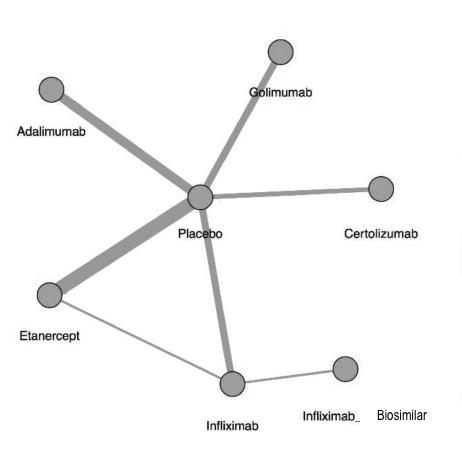 The figure below shows the network of treatment comparisons from the article. Direct comparisons are linked with a line; the line thickness is proportional to the number of trials that assessed the comparison. A total of 20 studies were included, 18 placebo-control and 2 head-to-head trials, involving a total of 3220 patients with AS, meeting modified New York classification. Effect of TNFi at 12 and 24 weeks was assessed based on BASDAI, BASFI and CRP. All TNFi were significantly more efficacious than placebo at reducing BASDAI and BASFI, and all but Certolizumab and Infliximab-biosimilar were significantly better at reducing CRP at 24 weeks. At 12 weeks, INF and INF-biosimilar was significantly more efficacious than other TNFi when analysis included an open label head-to-head trial of Infliximab to Etanercept. This effect was not seen when that trial was excluded. This difference was also not seen in the 24-week analysis. At 24 weeks, no TNFi was more efficacious than the other in reducing BASDAI, BASFI or CRP. The authors conclude that the lost difference in effect when the open label study was excluded likely reflects the influence of this head-to-head comparison in the network meta-analysis. I believe we can conclude, as the authors propose, that the choice of TNFi in AS can be guided by other comorbidities, such as inflammatory bowel disease or uveitis, or based on convenience and cost, but not by efficacy. For the time being, the article leaves us with some remaining questions to discuss: Why might there be an earlier response with Infliximab and Infliximab-biosimilar, and is this difference of clinical significance? Why or why not? As always, your thoughts and comments on the forum are welcomed. 1 Chen C, Zhang X, Xiao L, Zhang X, Ma X. Comparative Effectiveness of Biologic Therapy Regimens for Ankylosing Spondylitis: A Systematic Review and a Network Meta-Analysis. Cheng X, ed. Medicine. 2016;95(11):e3060. doi:10.1097/MD.0000000000003060. Phew it is always reassuring to see a study that supports our current approach to choosing a TNF agent. Continue to consider the patient and disease characteristics.